I’ve been a fan of the Chubby Vegetarian for awhile now, and I’ve been itching to try out this one recipe using homemade “meat” for “meat”balls. I couldn’t look him in the eye and said, “*mumble mumble* …balls”. You take a bunch of mushrooms and chop them up, then you take some eggplants and chop them up, and finally you chop up a few onions. You mix everything together with some fresh herbs and 2 crushed bouillon cubes, drizzle on some olive oil and balsamic and then sprinkle it with some garlic powder. Whack your pan into a hot oven for 20+ minutes and then let your newly created “meat” cool. From then on out you make a mix of normal meatball stuff (breadcrumbs, eggs, etc). You throw in some mushroom “meat” and use an ice cream scoop or tablespoon or something to facilitate your scooping needs. You lay your heaps o’ “meat” out on a lined baking sheet, shpritz with oil/pam and whack those in the oven for 10 minutes. Then you are supposed to paint on some pasta sauce and let them bake for another 10 minutes. I don’t have a brush for pasta sauce, so I ladled the sauce on. Oh, and in an attempt to try to give the BALLS some crisp, we broiled them for 2-3 minutes. I shoulda broiled these BEFORE I topped them with sauce. Live and learn. Don’t these just SCREAM to be covered in melted cheese? 1- Preheat your oven to 350 degrees. 2- In a large mixing bowl, combine cheese, breadcrumbs, mushroom meat, eggs, tomato paste, half and half, red pepper flakes, oregano, and parsley. Allow mixture to stand for twenty minutes so that the breadcrumbs soak up the flavor of the other ingredients. Using a small ice-cream scoop (about one tablespoon), scoop a portion of the mixture onto a parchment-lined, 12 x 17 inch, rimmed baking sheet. (You will want to portion them fairly close together as this makes a whole bunch of little meatballs.) Repeat until all of the mixture has been used. 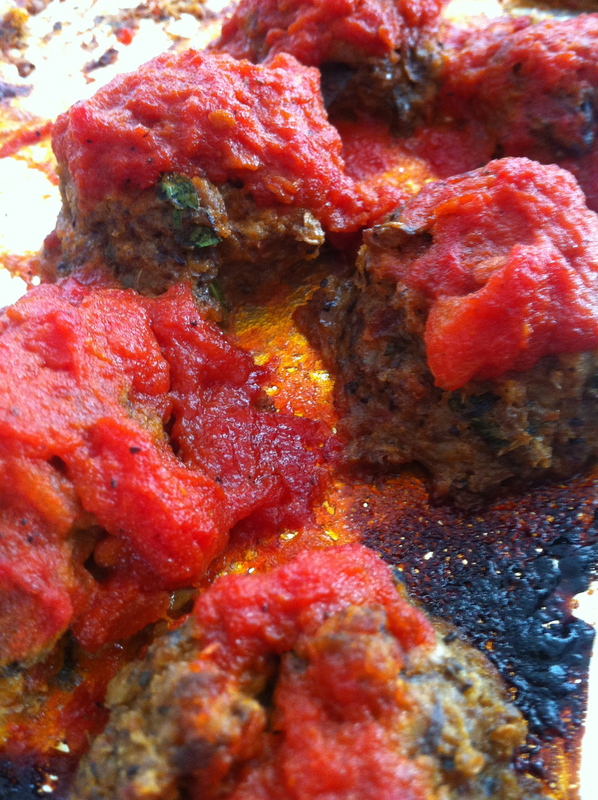 3- Drizzle the meatballs with olive oil. Place pan in the oven for a total of 20 minutes. 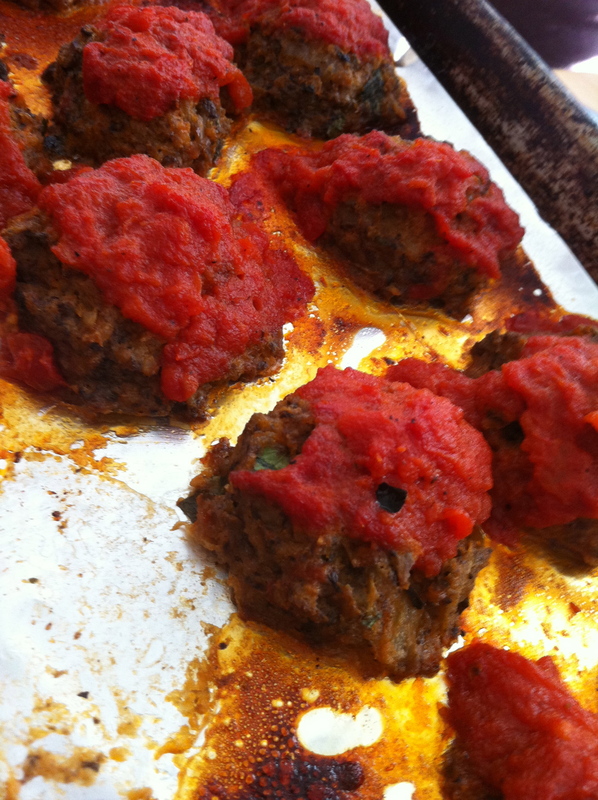 After ten minutes, take the tray out and brush the tops of the meatballs with tomato sauce. Return the pan to the oven to finish cooking. FOLLOW THIS LINK TO THE ‘MEAT’ RECIPE. 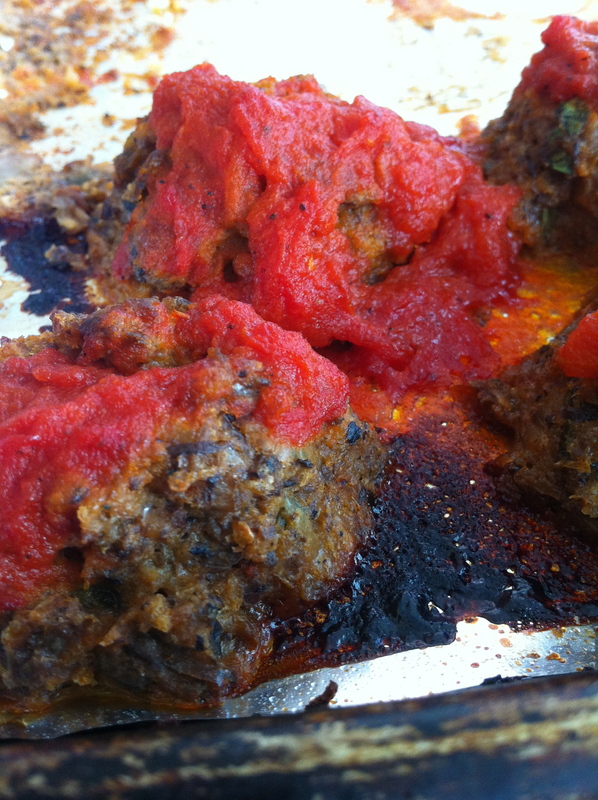 By the way, I was able to get 41 “meat”balls outta this recipe – that makes them 1 point+ each. I ate a DOZEN. No joke. Nom nom nom. I served these with spaghetti, baked sweet potatoes, and parmesan topped leeks. R ate 1.5 sweet potatoes and a whole ‘meat’ball, and J pretended his pasta was face-art. Thinking… If I can figure out how to make these more firm, I could totally see them as a party-time appetizer! …Covered in melted cheese of course! They sound super tasty! I loooooove mushrooms, such a deep and rich flavor. An excellent substitute for meat!